Q: CAN YOU WALK ME THROUGH THE SUBMISSION PROCESS? A: Absolutely everything you need to know to send us a sample for testing is included in a few simple instructions on the “GET A QUOTE” page and here on the FAQ PAGE. Please save us and you a lot of time by taking just a few minutes to read through both. You may be surprised at how much time you will save by doing just a few minutes reading. 00. Most new clients wonder WHAT TESTS TO GET. By default, we provide what is called the FULL PANEL, which required by the FDA for any material that is intended for consumption, whether it’s a food or dietary supplement. The FULL PANEL includes individual 3 tests for 1 sample, details of which are on the GET A QUOTE page. This includes ID/PERCENTAGE (We’ll tell you if your material is what you think it is, and what the alkaloid content is in it. ), as well as BIOLOGICAL (are there any pathogens in your material? ), and HEAVY METALS (are there any dangerous levels of metals such as lead in your material). 01. Find out HOW MUCH MATERIAL TO SEND based on the tests you want and what the material is by reading the “HOW MUCH TO SEND” FAQ. 02. Find out HOW TO PACKAGE your material by reading the “HOW TO PACKAGE YOUR SAMPLE” FAQ on this page. 03. Fill out the SAMPLE REQUISITION FORM found on the “GET A QUOTE” page, but in the link above. Let us know if you want the gold standard for pathogen testing, which is the “USP” method, a more forgiving, but slightly less accepted standard called the “FDA-BAM, CH 4” method, or if you want a very fast and precise DNA test using the “PCR” method ($119.00 per pathogen). Please note that the PCR method only detects for pathogens; it cannot determine if they’re living or dead. Only living pathogens are potentially harmful. If you don’t specify, we choose what we feel is the most appropriate test for your material. We also do pesticide testing for $99.00/sample – just request it on the form in the Description section. SO, STEP 1 IS TO SEND US MATERIAL BY FOLLOWING THE INSTRUCTIONS FOUND IN THE FAQ. 05. If you’re wondering HOW LONG WILL TESTING TAKE, please read the “HOW LONG DOES TESTING TAKE” FAQ on this page. 06. If you’re wondering about your WONDERLAND CLIENT DASHBOARD, please read the FAQ on that on this page. THEN, STEP 2 IS TO WAIT FOR US TO RECEIVE YOUR MATERIAL, CREATE YOUR LOGIN AND CLIENT DASHBOARD, SEND YOUR LOGIN DETAILS, AND THEN ISSUE YOUR INVOICE, WHICH WILL BE AVAILABLE ON YOUR CLIENT DASHBOARD. 07. If you’re wondering WHEN AND HOW TO PAY US, please read the “HOW DO I PAY YOU?” FAQ on this page. You can send your payment with your samples as well. This does speed up the process, and your invoice will simply show as PAID when we issue it. ONCE YOU GET YOUR INVOICE, YOU NEED TO SEND PAYMENT EVIDENCE OR YOUR ACTUAL PAYMENT, ALERTING US HOW AND WHEN YOU PAID. PAYMENT EVIDENCE IS A SCREENSHOT OF YOUR ELECTRONIC TRANSFER, OR A PICTURE OF YOUR SIGNED PAPER CHECK AND THE ENVELOPE IT’S BEING SENT IN, ETC. SEND THAT TO INFO@WONDERLAND-LABS.COM. 08. If you’re wondering HOW TO SEE YOUR RESULTS, please read the “WHAT EXACTLY DO I GET?” and/or the “WHAT EXACTLY IS THIS CLIENT DASHBOARD YOU TALK ABOUT?” FAQ on this page. You can also click the “STATUS” menu item to get a detailed description of the Client Dashboard. That’s also where your login is as well. PLEASE NOTE THAT BIOLOGICAL TESTING IS A 2-STEP PROCESS AND IT TAKES PHYSICAL TIME TO GROW BACTERIAL COLONIES IN THE INCUBATOR. WE CANNOT SPEED THIS PROCESS UP. PART ONE TAKES 3-4 DAYS, AND PART TWO TAKES 3-4 DAYS. 09. If you’re wondering HOW LONG TESTING WILL TAKE, please read the “HOW LONG DOES TESTING TAKE? FAQ on this page. FOR CLARITY: AFTER WE RECEIVE YOUR MATERIAL AND ASSIGN IT A SAMPLE SET, WE WILL CREATE YOUR CLIENT DASHBOARD. ONCE WE CREATE YOUR CLIENT DASHBOARD, WE WILL SEND A LOGIN VIA EMAIL. ONCE WE DO THAT, WE WILL THEN CREATE YOUR INVOICE AND SEND A SECOND EMAIL ALERTING YOU THAT YOUR INVOICE HAS POSTED AND IS READY TO PAY. 10. At the risk of repeating myself, please spend a few minutes and read this FAQ and the GET A QUOTE page. I can promise you that 99% of all questions we’re asked 12-24 times a day are answered, in detail. Empower yourself, spend a few minutes and read all you need to know about the testing process. If your question isn’t answered on the website, we are, of course, here to answer your questions. Most of the time, though, we end up reading the FAQ to you. Help yourself help us and thank you! HOW TO READ YOUR RESULTS? – CLICK ON THE “WHAT DO MY BIO TESTING RESULTS MEAN” BELOW. IMPORTANT NOTICE: You may be able to enter payment information on your WONDERLAND CLIENT DASHBOARD, but it’s not an active system, so please use one of the payment methods above. DO NOT CLICK THE “PAY” BUTTON TO TRY TO PAY. FOR FACEBOOK PAY – MAKE NO MENTION OF ANYTHING OTHER THAN YOUR SAMPLE SET & NUMBER. * We do have a credit card option for Kratom testing, but it carries a 12% service fee (our cost). Also, if there is anything related to Kratom on a website or email associated with your business name, there will be a 12% service fee as well. In addition, there are often international bank transaction fees that are beyond our control since credit card charges are passed through a foreign bank. KEY POINT 1: Customers with whom we’ve built a relationship with, who leave a credit card on file, or who pay us a retainer have the luxury of having testing start as soon as we receive your material, and of seeing results as soon as we have them. KEY POINT 2: We will add your material to the testing queue on EVIDENCE OF PAYMENT. This means you can scan the check you’ve sent us or take a screenshot of the payment you just sent us as proof of payment. THEN: Once we receive your payment, we will post that we have received your payment to your account. Watch your milestones for progress as your payment is received, your sample is added to the queue, and moves into testing. FINALLY: ONCE WE RECEIVE YOUR MATERIAL AND ASSIGN IT A SAMPLE SET, WE WILL CREATE YOUR WONDERLAND CLIENT DASHBOARD. ONCE WE CREATE YOUR CLIENT DASHBOARD, WE WILL SEND A LOGIN VIA EMAIL. ONCE WE DO THAT, WE WILL CREATE YOUR INVOICE AND SEND A SECOND EMAIL ALERTING YOU THAT YOUR INVOICE HAS POSTED AND IS READY TO PAY. A: Our lead time is currently 8-10 days for full panel testing, as we are running at maximum capacity. We OFTEN provide individual results as they complete in the lab, which go in order of ID/PERCENTAGE first, HEAVY METALS second, and BIOLOGICAL third. It’s important to note, though, that there is no way to speed up the physical processes required for sample testing. Samples can take 24-48 hours to get through the queue for Material Identification and Percentages, 48-72 hours for Heavy Metals detection, 72-96 hours for the first stage of Biological Testing, and then potentially another 36-48 hours for the second stage. That makes a total minimum Biological testing time of approximately 8-10 days when we’re running at maximum capacity. If re-testing is required, that starts a brand new incubation period, and the clock starts all over again. (We re-test at our expense whenever a unusual POSITIVE result comes up, though. We will either re-run the same test, or we may choose to switch from USP to FDA-BAM, which skips the enrichment process that the USP testing uses.) We can also do PCR testing for you; that is a DNA test and only takes 24-48 hours to get results. CRITICAL: Turnaround times are from the time the material comes up in the queue AFTER EVIDENCE OF PAYMENT IS RECEIVED, and NOT from the time your material arrives to us. For clients we’ve built a relationship with, we begin testing the moment your material arrives. Payment can be sent with your samples as well. So, depending on how rare the material you’re looking for is, and how extensive you want your testing to be, we can do ID rush jobs in 24 hours for a higher fee (1.5x – 2x the normal fee), but normal lead time typically runs at 8-10 days from the time of payment, even if you overnight your material to us without paying for express service. Any rush jobs need to be explicitly requested on the Sample Submission Form, and explicitly approved in writing by the lab. We know deadlines for testing is often yesterday, and we truly do understand how anxious and stressful it can be waiting for results, but we manage workloads as best we can. When we get numerous calls in a day asking the same few questions, it can slow things down, so patience is the best thing you can do for us and the testing process. Q: HOW MANY SAMPLES CAN I PUT IN EACH TEST? A: THE FDA REQUIRES ONE CERTIFICATE OF ANALYSIS PER LOT NUMBER OR INGREDIENT. As a rule of thumb, every batch or harvest of a single raw material usually has it’s own lot number. This lot number is either assigned by you, the manufacturer or supplier. The original grower or manufacturer of that single ingredient should have their own lot number for that single raw material, but that doesn’t always happen. WHY THIS IS: Let’s say one sample you have contains extremely high amounts of lead – high enough to poison a person who consumes that material. Let’s then say, to save money, you combine that material with 3 other samples that have extremely low lead content. When the 4 materials are combined into a single material, the high lead will be masked by all the low lead, and it may come up as a PASS in the lab. This means you wouldn’t know that you’re passing poisonous material onto your customer. The FDA also will not accept multiple raw materials or multiple lot numbers that have been combined to generate a single Certificate of Analysis. Let’s look at another example: The lower detection limit for E. coli using the FDA-BAM method is 3 CFU/g. To run this test, we use 9 test tubes, in 3 sets of 3. If one of those 3 sets shows positive for E. coli, that equals a positive result and is at our lower detection limit of 3 CFU/g. Now, let’s say you combined 4 materials into a single sample for testing. If we run those same 3 sets of 3 test tubes, and only 1 comes up positive for E. coli, it is now below our detection limit of 3 CFU/g. That means the product that showed positive for E. coli on an individual test, has now come up negative on a multiple material test. This is the same for any pathogen, including Salmonella. If you combine multiple materials together, not only are you diluting the tainted material, possibly causing a false negative on testing results, but you are also spreading out the tainted material inside non-tainted material. During sample prep of that material, it becomes a much higher probability that the lab will pull samples from the section of the material that is not tainted, invalidating the tests, giving you a pass result, when you are actually a fail. LAST NOTE: If you manufacture a new product from several ingredients, even if each raw material has a lot number, you are required to get a new test for that new, multiple ingredient product as well. The FDA sometimes accepts Certificates of Analysis for the raw materials that went into a product, but it’s at their discretion. Q: DO YOU OFFER PCR, DNA AND PESTICIDE TESTING? A: Yes, yes, and yes. We offer the faster pathogen test called “PCR” testing. This is a DNA test that can be run in 24-48 hours. The drawback to PCR testing is that it cannot determine whether the pathogen it detects is alive or dead. The only harmful pathogen is a living pathogen. So, although the PCR test may come up positive for say, Salmonella, if it’s dead Salmonella, it will be safe for consumption. Only the USP method and the FDA-BAM, Ch 4 methods test for LIVING pathogens. And we also do comprehensive pesticide testing as well; just ask for current pricing and coverage. Q: WHAT PACKAGE DO I SEND MY SAMPLE(S) IN? A: Honestly, it just requires some common sense. If you want to get a sample tested for purity at a lab, then take sensible steps to get the material to us untainted. Make sure you wash and dry your hands before taking a sample of the material, make sure the instrument you use to take a sample is clean, dry, and disinfected. To be extra safe, use a disinfectant in the area you’re going to be making the transfer. Make sure nothing additional gets into the material you are going to send us. FINISHED PRODUCT: If you have a finished product in a sealed container, you can keep it in that container. To be extra-sure it will get to us untainted and unspilled, please place that into a second container such as a Ziplok bag. RAW MATERIAL: If it’s a raw material, simply place it in a Ziplok or the container it would normally go into as a finished product. To ensure it stays sealed, place that initial package inside another bag that can be sealed, such as a Ziplok. Just make sure they’re new bags and not recycled packages that had yesterday’s lunch in it. LIQUIDS: If you’re sending a liquid, make sure you have a clean and sterilized container that will not leak when being sent through the mail. You can tape the top of the liquid container on, and then place that inside a Ziplok or two. Glass containers are fine, just make sure they’re sealed and properly protected. CRITICAL: Please read the FAQ on HOW MUCH MATERIAL TO SEND. We have to reject any sample that does not contain enough material for running our tests. Q: WHAT DOES MY PASS/FAIL ACTUALLY MEAN? A: It’s important to note that we base our “PASS/FAIL” results on FDA standards for food and dietary supplements. We have also integrated the AHPA’s guidelines for what constitutes a PASS or FAIL. For some results, such as specific Coliform, E. coli, Salmonella, and Staphylococcus, there is only a PASS/FAIL, so any numbers associated with them do not mean much. When it comes to YEAST, MOLD or AEROBIC PLATE COUNTS, we follow the FDA guidelines on what are acceptable levels of each in a product that is intended for consumption. So, if your material is a FAIL for Yeast, Mold, or Aerobic Plate Counts, it means that your material did test negative for the dangerous pathogens above, but that there are still high yeast, mold and bacterial counts (Aerobic Plate Count) in the material. If it’s a “FAIL” onYEAST, MOLD or AEROBIC PLATE COUNTS, it’s up to the manufacturer to decide if they want to continue manufacturing any products made from that material. Even though it is free of the potentially dangerous pathogens we test for, it still may not be suitable for consumption or even topical use. HIGH AEROBIC PLATE COUNTS reveal the level of bacteria in the material. Sometimes, not always, it can indicate the condition the material is in, in terms of spoilage or freshness. Aerobic Plate Counts can also be used when evaluating the sanitary practices during manufacturing and processing of any material. We get bacterial counts by taking a sample of the product and placing it in a neutralizing broth, then placing it onto glass plates at the proper dilution. We then incubate those plates for several days at a specific temperature to see if any aerobic bacteria are present in the material. HIGH MOLD COUNTS can reveal how the product was handled. If it sat in a damp area for a long time, if the material was packaged and sent to you before it was properly dried, or if it was harvested from the ground rather than from the plant – these are all things that a high mold count can help reveal. For AEROBIC PLATE COUNTS and HIGH YEAST AND MOLD COUNTS there isn’t an absolute scale. Once you determine there is a higher than generally accepted plate count, you must either do further research to see why this might be, perhaps running a DNA test to find out what exactly that bacteria is, helping you to determine its source, or looking for fresher product that was handled more professionally. We cannot make those decisions for you or answer those questions for you. As far as HEAVY METALS, we also use the FDA guidelines for acceptable heavy metal levels, including the strict Proposition 65 level that California somehow got passed. Since a lot of plant material contains higher-than-acceptable levels of lead naturally, often higher than what California allows to be in plant material, we no longer put “FAIL” when the lead is high in your material. We simply place “HI-LEAD”, but please understand that “HI-LEAD” according to our strict standards is the same as a “FAIL”. Again, it’s up to the manufacturer to determine what levels are acceptable, depending on the use of the material. We’re primarily a botanical and dietary supplement testing lab, but with a focus on Kava Kava and exotic botanicals such as Akuamma, Kratom, Blue Lotus/Blue Lily, Kanna, Sinicuichi, Wild Dagga and many others. This means that you can send us any legal material, and ask us to VERIFY its identity, IDENTIFY any key compounds, alkaloids, or other materials in it, we can QUANTIFY percentages of any of those compounds, and we can TEST FOR CONTAMINANTS OR ADULTERANTS in your product. If you want to know whether the product you are purchasing is actually what it claims to be, we can help. If you want to know how much of a particular compound or alkaloid is in that product, we can help as well. Kava Kava is our specialty, as are other lesser-known and exotic botanicals, but we can test just about anything that can be tested. If you want to make sure there’s nothing dangerous in your material, such as bacteria or heavy metal contaminants, we can find out for you as well. Our parent company; FLORASCIENCE, INC. also does everything from custom extractions, to product formulation, to manufacturing, distribution, and private labeling of dietary supplements. We can help turn your ideas into a safe, verified, GMP-produced, marketable product that will put you miles ahead of the rest of the competition. Simply click to FLORASCIENCE, INC. to find out more about product development or CONTACT US to get a no-obligation quote. Any samples sent to us must be discussed via email or voice, and must accompanied by our Sample Submission Form, NO EXCEPTIONS, sorry! You would be amazed at how many samples we get in that are not what they claim to be, are adulterated, or have dangerous pathogens in them. Check out our VERIFY page for more details. Not only does making your customers sick put you into a difficult legal position, it will lose you trust, business, and sales. Testing is a small piece of insurance that pays back far more than it costs. 100% of the companies with whom we have tested for have reported positive sales numbers, increase in trust, and a heightened confidence that they’re not only providing their customers with the high-quality product they thought they were, but they are providing a safe product that won’t cause anyone who works with it or consumes it any health problems. Certificates of Analysis are great sales tools as well; any product that has certification by the 3rd party lab such as Wonderland-Labs will automatically be trusted more by your customers. In the end, isn’t our #1 goal to protect the health and safety of our customers? If so, then Wonderland-Labs can help you achieve that goal in just a few days time. Q: What exactly do I get? A: You FIRST get your results electronically via your WONDERLAND CLIENT DASHBOARD. Then, you get a signed and embossed FDA-accepted Certificate of Analysis with key data related to your product or material. We maintain strict traceability indefinitely and sample retention for 2 years, and can back up any results with 3rd party verification whenever required. Wonderland Labs prides itself on the accuracy of its testing, the presentation of its results, and the traceability of its methods. 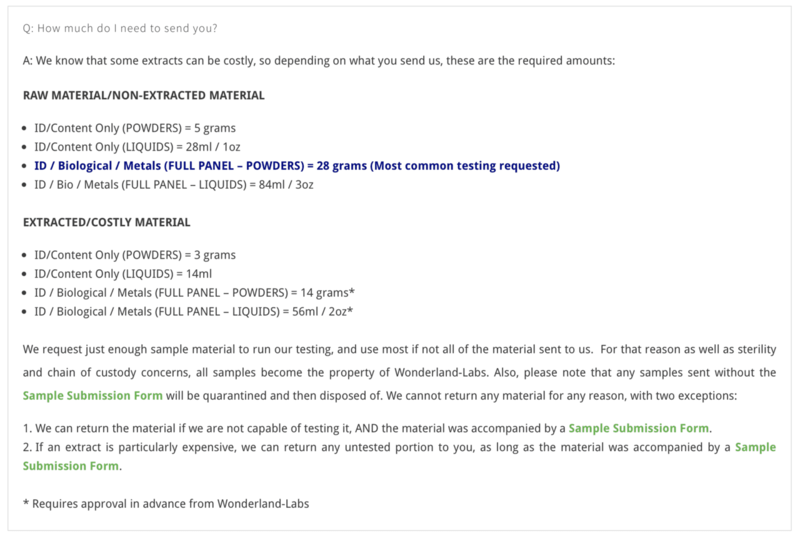 Please note that any samples submitted become the property of Wonderland-Labs, and all samples must be accompanied by a Sample Submission form, or they will be quarantined and then disposed of. Q: What tests should I get? A: We wish we could answer this question for you, but that is one you have to decide for yourself. The next question is often; “Well, what tests do most other people get?” – Again, there is unfortunately no “usual” when it comes to testing. We get an equal amount of clients who get just the ID/Percentage, we we have those getting the FULL PANEL, or combinations thereof. For any material that will be intended for consumption, we run the exact tests required by the FDA. This does not mean that if we run the tests and the material is free from pathogens, that it’s legal for consumption. That is far outside our purview as a lab. We simply test for the common pathogens and levels of heavy metals as is required by the FDA, and then report on our findings. Testing for ID/Percentage is critical to know if the material you’re testing is what you actually think it is. Testing for Biological contaminants is critical if you want to know if it’s free of pathogens such as E. coli and others. Heavy Metals testing is critical to know if the material has been adulterated, or if it has unacceptably large amounts of standard heavy metals in it, making it unsafe for consumption. Q: This all sounds very expensive! A: Actually, product identification and purity testing is quite cost effective. Also, once you have verification of a potential product sample’s purity, safety, potency, or identity, for just $99.00, you could potentially save thousands in product purchases that weren’t exactly what were advertised or promised. It’s also great marketing material. And honestly, it’s a small price to pay for your customer’s safety and your confidence. Check out our VERIFY page for more details. Identification/Quantification ($99.00): We will positively identify the material you have provided, and provide you with the key Kavalactone or alkaloid content within the material. This test takes 24 hours. Heavy Metals ($149.00): We test for Arsenic, Cadmium, Lead and Mercury. Each test is $50.00 if ordered individually, although the FDA typically requires those core 4 for foods and supplements. This test takes 48 hours. Biological Contamination ($99.00): We test for all major contaminants, and offer an FDA-compliant package of Aerobic Plate Count, Yeast, Mold, E. Coli, Coliforms, Staphylococcus, and Salmonella. This test takes 96 hours. We provide stamped and signed certifications from our FDA and EPA registered manufacturing and testing facility in addition to emailed PDF files for quick reference. There are a few rare exceptions to testing costs, such as requests for DNA testing, or testing of certain trace alkaloids such as 7-hydroxy and a few others. DNA tests vary by material, but are usually about $350.00 per test. Trace alkaloids vary by material as well, but usually run about $150.00 additional. Q: How much do I need to send you? We can return the material if we are not capable of testing it, AND the material was accompanied by a Sample Submission Form. If an extract is particularly expensive, we can return any untested portion to you, as long as the material was accompanied by a Sample Submission Form. A: For new clients, we do not start testing until we have evidence of your payment, such as a scan of the check you send us or a screenshot of the ACH transfer you make. There are instances where we may start testing in advance of payment but that is at our discretion. For returning clients, once we establish a business relationship with you, we will begin testing as soon as we receive your material, but won’t release results until your payment has cleared or has been received by us. For long-term clients who have a perfect record of on-time payments, we will release results as soon as we have evidence of payment, or if we have your credit card on file. Q: Where do I send samples? OVERNIGHT/EMERGENCY: Contact Keith at hotline@florascience.com or 800-647-3154 for our FedEx street address. CRITICAL NOTE: WE DO NOT ACCEPT DROP-OFFS – EVERYTHING IS HANDLED THROUGH MAIL OR FEDEX. Please know that it physically takes 24 hours to get you IDENTITY/PERCENTAGES, it physically takes 48-72 hours to get METALS, and it physically takes 72-96 hours for BIOLOGICAL TESTING minimum. It takes time for saturation for the metals and for colonies to grow for the biological. So, even if you paid us for Same Day service for METALS or BIOLOGICAL, it’s physically impossible to do that for you. Q: Please explain my Client Dashboard? A: The Dashboard is an ultra-secure, up-to-the-minute outline of the entire testing process. You will know exactly where in the process your material is, from the moment we receive it, to the electronic invoicing, to when it’s up next in the queue and so on. You will get all the necessary details as you need them, and since we are 100% paperless, your requisition form, invoice, initial results, and final results will all be available as PDF’s on your dashboard. Yes, we still send out official stamped, signed, and embossed certificates after the PDF copies are posted to your account. Take a look at an example of the Wonderland Client Dashboard if you’re curious. KEY POINT: ONCE WE RECEIVE YOUR MATERIAL AND ASSIGN IT A SAMPLE SET, WE WILL CREATE YOUR WONDERLAND CLIENT DASHBOARD. ONCE WE CREATE YOUR CLIENT DASHBOARD, WE WILL SEND A LOGIN VIA EMAIL. ONCE WE DO THAT, WE WILL CREATE YOUR INVOICE AND SEND A SECOND EMAIL ALERTING YOU THAT YOUR INVOICE HAS POSTED AND IS READY TO PAY. Q: Can I drop samples off to you? A: Not in any case, and there are no exceptions, sorry. Everything is handled via our mailing address. Due to strict protocols for cleanliness, and because of a number of proprietary systems we have in place, we are not set up to accept outside visitors. Our doors are locked during the day because 99% of the time, we’re gowned up in lab coats, hair nets, booties, and cannot take the time to stop, undress, and answer the door. We include detailed instructions for how to send us material, how to package it safely, and where to send it to on our GET A QUOTE page and our FAQ page, which you’re already on. You can FedEx material to us if it’s an emergency, and we do have a 24 hour turnaround time in those cases. Q: What if my product comes up adulterated? A: Adulteration in a material is not always a bad thing, especially if you’re making a blend of multiple materials into a single product. For example, if you are making a finished good that’s made up of 3 different herbs and want to get that finished good tested as is required by the FDA, if you’re looking for the percentage of single alkaloid that’s contained within just one of those three herbs, the results will come up as “Possible Adulteration” or “Adulterated”. Or, if you send us material that’s an extract and don’t tell us it’s an extract, it will likely come up as adulterated or possibly adulterated. This is because extracts have different profiles than unprocessed raw material. For example, if a client sends us a sample labeled “Kava” but it’s actually a “Kava Extract”, it’s going to have a different chromatogram than raw Kava. So, if the material you send us is anything other than 100% of a single unprocessed raw material, no matter what it is, it will come up as adulterated. In that case, what is most important, is that your product comes back with no pathogens or heavy metals. All we are determining is if the material you have provided us with is raw, unadulterated, unprocessed, just as it was harvested from Mother Nature material. This is why it’s critical to alert us to the exact nature of your material. If it’s a blend, we need to know it’s a blend, and what components are in the blend (we don’t need to know the amounts of any proprietary blends). If it’s an extract, we need to know that it’s an extract, so we can compare the profile of your material against a pure extract of that same material. It also helps to know the solvent that was used when the extract was made; we have a large profile of extracts that have been extracted using different solvents. A material extracted with ethanol will have a different profile than a material extracted with methanol, or hexane, or various other solvents. The way we determine “adulteration” is by comparing the material that’s sent to us against three different reference standards. One reference standard is an isolated alkaloid from the material. The second sample is raw, unprocessed material that we either grow in the lab ourselves, or know to be 100% pure plant material. The third is a set of extracts using several different solvents, including ethanol, methanol, and several others. This way, we create a visual reference called a “chromatogram” for each material. This chromatogram shows us what pure material looks like, which is very similar to a fingerprint, with one distinct difference: Plants of the same species and sub-species share extraordinarily similar visual profiles, unlike fingerprints and snowflakes which are all unique. So, Tudei Kava, in both the Kavalactone lineup and the chromatogram will look very different than Noble Kava from Vanuatu. We have profiles for 14 different strains of Kava, so not only are we able to see what the Kavalactone lineup is, the chromatogram allows us to often discern the strain of Kava the material might be. This reference holds true for many of the products we test, including Mitragyna speciosa and several others. If your material comes up as “possible” adulteration, it simply provides you to be cautious when making purchases of that material. If the alkaloid content is what you care most about, and the alkaloid content is exactly where you expect it to be, and both the biological and heavy metal testing come up negative, then it’s up to you to pursue any additional testing. Additional testing could consist of DNA testing, which typically costs about $349.00 per test. Q: What if you find something illegal in my product? A: This is a great question, and although it may sound like an odd one, we’ve been asked it enough to warrant an entry in our FAQ. The bottom line: there’s something known as “attorney-client privilege.” The same principle applies for anything we test here at Wonderland-Labs. Obviously, we will not test any known illegal substances, but if something unexpected and/or illegal is found in the material you provide us with, we will not suddenly call the police to report our findings. We operate with complete confidentiality, and immediately dispose of any material that is found to have something illegal in it. We will report our findings to you, and it’s up to you to take whatever action is required to remain within the letter of the law. This possibility is part of the core reasons for running tests on any material you plan to offer for sale. We’ve had more than a few lots of material that had completely unexpected adulterants in them. One of the most common adulterants occurs with Mitragyna speciosa samples we receive. There are several compounds that reflect light in nearly the same way that mitragynine and 7-hydroxy reflect the light. Without knowing it, you could be passing that adulterated product onto your consumers, and if that product was eventually tested by the FDA or DEA and there was an illegal adulterant found in the product, you would be on the hook for distributing and selling that material and/or finished product. When you look at it that was, $99.00 is a small investment to ensure the material you think you’ve buying in good faith, is actually the material you think it is. Q: How can you provide such inexpensive testing? A: When it comes to testing materials, everything we offer testing for has to have a profile associated with it. This means that we need to have purchased a reference standard for any material we test here at the lab. Depending on the availability and complexity in testing, this can cost you upwards of $2,500.00 or more. NOT AT WONDERLAND-LABS. We specialize in rare and exotic botanicals such as Kratom, Wild Dagga, Kanna, Lotus, Lily, Akuamma, Rivea Corymbosa, and many others. What this means is we’ve already developed a profile and reference standard for all of the materials in our current portfolio of materials we can provide testing for. Q: Can I get my samples back? A: We request just enough sample material to run our testing, and use most if not all of the material sent to us. For that reason as well as sterility and chain of custody concerns, all samples become the property of Wonderland-Labs. Also, please note that any samples sent without the Sample Submission Form will be quarantined and then disposed of. We cannot return any material for any reason, with the exception that material can be return if we are not capable of testing it, AND the material was accompanied by a Sample Submission Form. Q: What if you can't test my material? A: All testing is up to the discretion of Wonderland-Labs. If any sample is deemed unsafe to test, or if it needs to be tested for something we cannot test for, as long as a Sample Submission Form accompanied the sample, this is one exception in which we can return your sample to you. Any sample that was not accompanied by a Sample Submission Form will be quarantined and then disposed of. Please do not send any samples with any intrinsic value unless we specifically discuss the samples via voice. Q: Can I come visit the lab? A: We wish we could give tours of the lab, and although you can come by to meet the staff, you cannot actually see inside our lab or Clean Room. Methods and protocols were painstakingly developed, with a very specific range of equipment, and in this hyper-transparent world, we still have a great deal of proprietary information that must remain behind closed doors. Also, with strict attention to pharmaceutical grade cleanliness, we don’t take any chances on contaminating our HEPA and bio-filtered lab environment. Q: How can I take you seriously? A: We strive to be different, and quirky and fun. No regulations state that a serious laboratory has to have gloss white walls and putty-colored floors. We’re sometimes here at the facility more than we’re at home, so we decided to make it into a space we all thoroughly enjoy working in. We chose a theme from a movie we all adored; Alice in Wonderland, and named our lab after that. Proudly a division of Florascience, Inc., Wonderland Labs specializes in Kava Kava analysis, Kratom, Wild Dagga, Kanna, Blue Lotus/Lily, and other rare or exotic botanicals. We will let you know if you’re getting what you think you’re buying.